Home › Electrical Engineering Forum › General Discussion › How does electricity meter work? PeterJohn 2 years, 4 months ago. Today the topic on which I am going to share my knowledge with you is the working of an electricity meter. Yes, that’s right! I am talking about the very meter that is already in your homes and you see them daily. But have you ever wondered how do they work? What is the mechanism through which you can see the data of energy you consumed stored in them? Now you need not to worry. Here is an inside peek for you to know more about them. The basic type of electricity meters that are being used commonly now-a-days are the electromechanical meters. The principle of operation of electromechanical meters will be explained briefly below. Electromechanical meters are the most commonly used types of meters now-a-days which are being extensively applied to calculate the energy usage especially in house hold applications. The metal disc placed on a worm gear and surrounded by two coils. The two coils are connected to the main house electric circuit such that the first coil produces a flux whenever current passes through it. So the amount of flux produced is proportional to the amperes passing through it. These amperes after passing through the coil and producing the flux then are used by the different appliances in the house. For the other coil, is connected in the voltage line such that when the volts pass through it a flux is produced in the other coil. The voltage coil lags the current coil by 90 degrees. 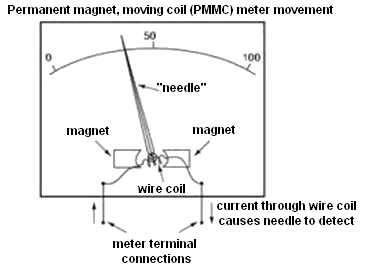 So that the mutual effect of both these current and voltage coils forces the central nonmagnetic metal disc to rotate. 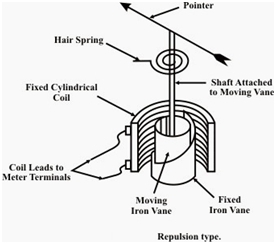 The rotation of the metal disc is proportional to the mutual product of current, voltage and the angle. The worm gear and spindle drive helps the disc in rotating. A permanent magnet is also placed near the disc such that it exerts a force on the rotating disc. The magnitude of the force is proportional to the speed of rotation, but the direction of this force is opposite to the direction of rotation. The resultant of these forces is such that the rotation of the metallic disc is proportional to the energy usage. These meters give us the energy used in kilo watt per hour (KWh). Not to mention, but each one of us knows the usage of these electric meters. They are widely used to calculate the energy usage, not only in our houses but at offices or whatever place we require electricity. It won’t be unjustified if I say that they are a must wherever electricity is required. The electricity supply companies also make use of these meters to estimate our electricity usage and then bill us accordingly. In short they are a must for all homes now-a-days, as essential as electricity itself. I hope now you are also aware of its working and this short article of mine was just a little step for you to increase your knowledge about this commonly used measuring unit. To more about more of such devices, keep visiting us. We will be posting more soon. What’s your impressions on this article? Hey,,Thanks for sharing basic parts of electromechanical meter. Hi everyone…i am a new user here. Thanks for sharing such a useful information here. It is really very helpful for me. I want to confirm that it is wattmeter? And what is the difference between PMMC and Air-dyno type instruments.